Uh... hey there! Thanks for coming to my TED talk. This one's gonna be all about how I really want a UC Plushie Zafara. I mean, who doesn't want one? But, I don't want one as trading fodder up to a higher tier, I want a permie to keep forever and ever! As of right now, I have a chain I am working on getting up to Tier 7, so that I can be considered for offers. I guess you could say that I have a nostalgia problem. You see, I have been on this site since 2003. I have a preference towards UC pets simply because of the nostalgic imagery of the old site art. I love that early/mid 2000s art style and I am not a *huge* customizer, although I do like the background and trinkets quite a bit! Having a UC Plushie Zaf would fulfill my childhood desire to have a Plushie Neopet of my favorite neopet species!! Thanks for viewing my project page! As a disclaimer, I really don't want to trade Mixiat or Jhelpi, because I love them, but I WOULD trade them for a Plushie Zaf. Normally I would consider them permies, but I want a Plush Zaf so badly, that I would consider trading them for one!! Jhelpi is a childhood pet of mine, and I don't want to trade him for ANYTHING except a Plushie Zaf. He is a UC Faerie Xweetok. So, I started off at a high tier! I decided to put Zuragnos up for trade back in December of 2018, because I realized that I wanted a Plushie Zafara more than her. o-o; Poor Zuragnos. I made it to Tier 7! But there's still so much work cut out for me! Update: I became really frustrated and sad with trying to UC trade... So I traded my Faerie Tonu for a vvwn Faerie Ixi named Mixiat. Here's some art I drew of Plushie Zaf! All of my other Neopets art is over at this page. 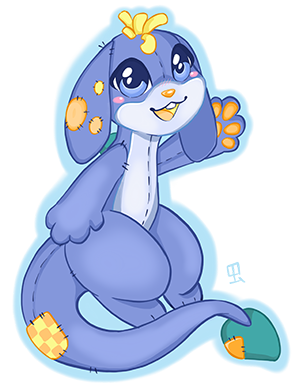 It's a little difficult for me to create a character for a Neopet without knowing their name, but for my Plushie Zaf, I imagine that he would be a boy! I know that a lot of UCs are female, but for some reason I see my future zaf being a Plushie Prince. xD He would wear a little crown and believe he was royalty. He would have an army of Plushies that he called is Kingdom, with unblinking button eyes. Links to More Info About Me! Read more about our Family here!! Check out my art of my pets here!! Layout and coding made by Jewlz at Element. Heavily edited by me, Gina!